Noot Thai uses their own specialised couriers to deliver their food. Minced pork and vermicelli served with mild plum sauce. Deep fried puff pastry filled with potato, onion, spinach and curry powder. Minced fish fillet with curry paste and Thai herbs. Minced chicken and crushed nuts wrapped in pastry served with sweet chilli sauce. A mixture of 1 x Fish Cakes, 1 x Spring Rolls, 1 x Curry Puffs, 1 x Satay. Seasoned with lemon grass and Thai herbs. Seasoned with coconut milk, galangal and Thai herbs. 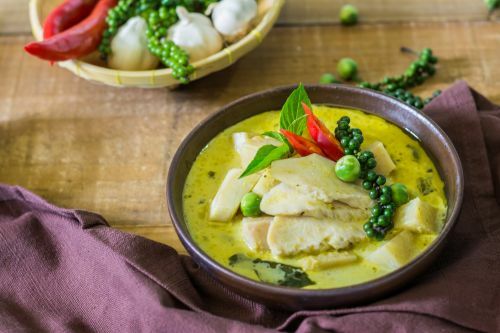 Panang curry, chicken, beef or pork cooked with coconut milk, crushed peanuts and vegetables. Chicken or beef stir fried with garlic, coriander root, peppers and vegetables. Chicken or pork stir fried with vegetables and oyster sauce. Chicken or beef stir fried with hot chilli, vegetables and Thai basil. Chicken or beef stir fried with cashew nut, chilli jam, onion, capsicum and shallots. Chicken or pork stir fried with fresh ginger, onions, capsicum and shallots. Chicken or beef stir fried with vegetables, topped with Thai peanut sauce. Deep fried potato, onion, spinach and curry powder wrapped in puff pastry. Special Thai fried rice with chicken or pork and egg.